KitMonsters – Roland TB-303. The music makers’ guide to making music. 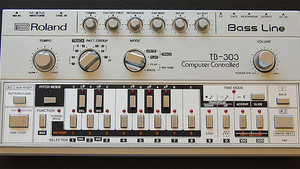 The TB-303 (short for “Transistorized Bass”) was originally marketed to guitarists for bass accompaniment while practising alone. Production lasted approximately 18 months, resulting in only 10,000 units. It was not until the mid to late 1980s that DJs and electronic musicians in Chicago found a use for the machine in the context of the newly developing house music genre.